Between 1935 and 1943, a group of photographers under the direction of Roy Emerson Stryker set out to photograph the United States for the Farm Security Administration and the Office of War Information. Photographs taken by this celebrated group, whose ranks included Dorothea Lange, Ben Shahn, Gordon Parks, Russell Lee and Walker Evans, have since become icons of the 1930s and 1940s. In recent years, however, their work has been reproduced with little discussion of the particular circumstances surrounding its creation. Documenting America takes a fresh look at these remarkable photographs. The book opens with two incisive essays by Lawrence Levine and Alan Trachtenberg that examine issues central to photography and American culture. While Levine explains how the pictures portray the complexity of life in the period, balancing scenes of Depression hard times with images of the pleasures of life, Trachtenberg analyzes the way in which viewers read photographs and the role of the government picture file that stands between the creation of the photographs and their use. Both essayists raise important questions about Stryker's grand ambition of a photographic record of America, about the "ways of seeing" that have grown up around the most famous of these photographs, and about the whole enterprise of documentary photography and the conventions of realism. The images themselves are presented in series selected from groups of pictures created by single photographers. A documentary photographer often makes dozens of exposures to portray different elements of the subject, experiment with camera angles, and cover the stages of an event or steps of a process. By studying these pictures in series, we come closer to the photographer working in the field. We see a tenant farming community in Gee's Bend, Georgia, the activities of the Salvation Army in San Francisco, and the hubbub and commotion that filled Chicago's Union Railway Station in 1943. Texts accompanying each of the book's fifteen series describe the circumstances that gave rise to the creation of the pictures and discuss the relation between government policy and the subjects of the photographs. 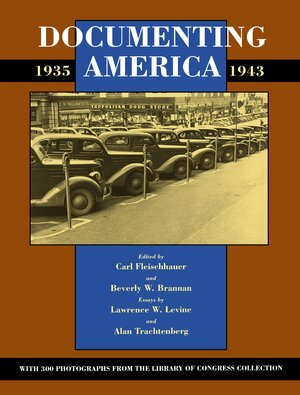 The nearly three hundred images included vividly portray America in the last bitter years of the Great Depression and the first years of the Second World War. Carl Fleischhauer is a Folklife Specialist and Beverly Brannan is a Curator of Photography, both at the Library of Congress. Lawrence W. Levine is Margaret Byrne Professor of History at the University of California, Berkeley. Alan Trachtenberg is Professor of American Studies and English at Yale University.